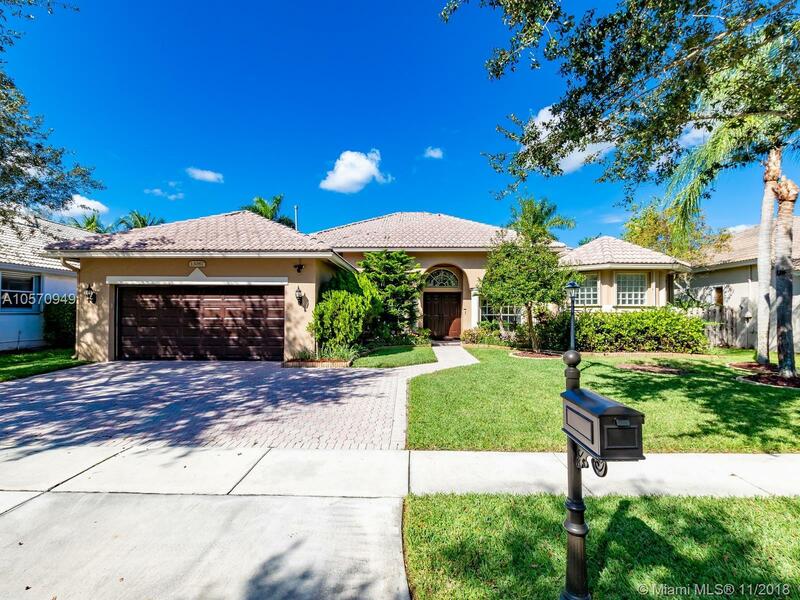 13067 NW 23rd St, Pembroke Pines, FL.| MLS# A10570949 | Susan J Penn l Best Agent l Buy & Sell South Florida Homes! Beautiful 4 bedroom/3 bathroom plus office with french doors that can be easily converted into a 5th bedroom. This Monterey model is very spacious with lots of natural light. This home features an updated kitchen with modern stainless steel appliances, wood cabinetry, Corian counters w/ breakfast bar, double basin under mount sink, kitchen island, large pantry and computer workstation. Bathrooms are updated, gorgeous wood and tile flooring. New A/C is less 2 years old, hot water heater is less than 2 months old, and large generator. Brand new patio screen, brand new diamond-bright surface in pool. Home is impeccably kept. Sellers are motivated. Directions: From I-75 Go East Sheridan Street To Pembroke Falls Blvd. Go Through Guard Gate And Make First Left Into Majestic Bay. House Is About 1/2 Mile On Left.